There is no endurance of the changing body. That the body is changing every moment by the actions and reactions of the different cells is admitted by modern medical science; and thus growth and old age are taking place in the body. But the spirit soul exists permanently, remaining the same despite all changes of the body and the mind. That is the difference between matter and spirit. By nature, the body is ever changing, and the soul is eternal. This conclusion is established by all classes of seers of the truth, both impersonalist and personalist. In the Vishnu Purana (2.12.38) it is stated that Vishnu and His abodes all have self-illuminated spiritual existence (jyotimsi vishnur bhuvanani vishnuh). The words existent and nonexistent refer only to spirit and matter. That is the version of all seers of truth. This verse describes the results for those who have attained the level of discrimination. Actually as sruti says, the soul is not attached to matter: asango hi ayam purusah. (Brhad Aranyaka Upanisad 4.3.15) Thus, the jiva does not have a relationship with the subtle or gross bodies and its products such as lamentation and bewilderment. This relationship is caused by ignorance. This is explained in this verse. There is no existence (bhavah) of the body (asatah), the shelter of lamentation and bewilderment, because of its opposite nature to the soul, in which these do not exist. And there is no destruction of the jiva with its real form (satah). The conclusion (antah) about both of these—the body and the soul – is seen by the seers of truth. By this, there will be no lamentation or bewilderment arising from seeing body and things related to the body because of the eternal, indestructible soul in Bhisma and others of the opposing party as well as you and your allies. 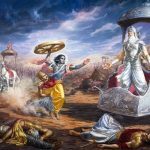 How can Bhisma and others be destroyed, and why do you lament for them? The soul is eternal as verified in the Vedas. Why is the soul eternal? Is there anything else eternal as well? Hence it is stated in the verse beginning nasato vidyate. 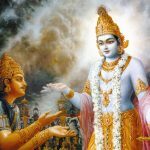 There is no annihilation of a-sat meaning prakriti which is the material substratum or sat referring to the Ultimate Truth because it is declared in the Visnu Purana that prakriti, purusa and kala or time are eternal. Because the word vidyate has been seperately used in relation to sat and a-sat and because it has been said in Srimad Bhagavatam also known as Bhagavat Purana that a-sat is the physical manifestation and sat is of the subtle form the Ultimate Truth of reality, a-sat is known as manifestation of sat, the unmanifest. This understanding for both a-sat and sat and is confirmed by the word anta meaning summation. 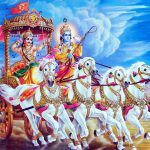 The actual sorrow expressed by Arjuna is not being felt because the consequences of war lead to misery in the next life. The rule in the material existence is that every action has its corresponding and equal reaction, thus it is seen that by unrighteous actions there is no happiness and by righteous actions there can be no unhappiness. The words referring to sat bhavah are all connected to happiness and the words connected to a- sat abhava are those which are connected to sorrow. Thus it is stated in Shabda Nirnaya that sat bhava is sadhu bhava, having meritorious disposition and we will see this word used again further in the Gita. Therefore for whatever is in righteousness the word sat is used. Whoever has thought they have become a-sat, asat brahmeti, for this person their personal conceptions have become a-sat and consequently they become sorrowful. It should not be misconstrued that the purpose of this verse is to deny the existence of what is appearing now in the present, was non-existing before creation and would be non-existent after destruction. This would be a contradiction in itself. The statement nasato vidyate bhavo is specifically used to emphasise a spiritual truth. Although in normal everyday life people relate to the material manifestation as if it did not exist before and will also cease to exist hereafter. For example a flower to be offered to the Lord which blossomed today, did not exist last week and by next week it will have ceased to exist but still it is utilised while it is here. So there is no reason to reflect that any of this is due to delusion. All acts prior to creation and all acts after the dissolution of creation cease to exist is the Vedic statement. If in each action the specific form was not manifest before it was born but came to be formed only later, then wisdom and normal circumstances would not justify such a statement. If according to wisdom and normal circumstances an archetype existed before the form came to exist then before anything is born it did not, in fact exist. Even due to the experiences of modification there is action and its result. Because of these modifications the experiences of the physical body become apparent. Normal affairs in this world take place on the basis of these modifications and the experience connected with these modifications solely. It is not correct to accept that this world is made up of special attributes such as sat the Ultimate Truth due to its perception of modification and a-sat as the physical manifestation by its being self evident. Both the experiences are subjected to delusion. The physical manifestation is spoken as such because it is evident not because it is understood. If it is non-existent then its knowledge is without purpose even if it is non-manifesting. A falsehood can never be validated by another falsehood. In delusion the false appearing as truth can never be accepted as real. In normal life the unreal cannot cease to be in any case. That which exists as its form may also appear as real and the same is the case with delusion. Even though it is indescribable, when what is real appears as truth verily such appearance of truth cannot be accepted as false on the assumption that it is delusion. Thus the truth which appears as unreal should also be accepted then there is no contradiction. In the Vedic scriptures it is stated the cosmic manifestation is truth. What is created is the truth. The sages and rishiâ€™s who contemplating deeply describe the Ultimate Truth as Self evolved and Self evident and by such words declare the eternal existence of all things created. It is seen that one feels extreme discomfort due to bodily experiences of excessive heat and cold and the like; if this is the case then what is the experience for one who remains unconscious of the soul even unto the moment of a very painful demise. How can they realize that heat, cold and pain to be impermanent and how can they imagine the eternal reality of the souls immortality. Such questions and bewilderment is clarified by Lord Krishna with the words in the impermanent like heat, cold, pleasure and pain there is no duration and in the permanent as the eternal soul there is no cessation. It must be understood that this nature of the duration and cessation of things in this world cannot be ascertained by one lacking spiritual intelligence. 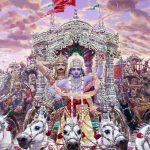 Lord Krishna emphasizes the point that the reality of the duration and cessation in the material existence has been perceived by those elevated souls who have attained the Ultimate Truth. The eternal reality of the souls immortality is revealed in various places in the Vedic scriptures and this has been realized by those who have achieved this understanding. 2.16 Since ‘the unreal has no being,’ etc., for this reason also it is proper to bear cold, heat, etc. without becoming sorrowful or deluded. Asatah, of the unreal, of cold, heat, etc. 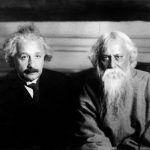 together with their causes; na vidyate, there is no; bhavah, being, existence, reality; because heat, cold, etc. together with their causes are not substantially real when tested by means of proof. For they are changeful, and whatever is changeful is inconstant. As configurations like pot etc. are unreal since they are not perceived to be different from earth when tested by the eyes, so also are all changeful things unreal because they are not perceived to be different from their (material) causes, and also because they are not perceived before (their) origination and after destruction. Objection: If it be that [Here Ast. has the additional words ‘karyasya ghatadeh, the effect, viz pot etc. (and)’.-Tr.] such (material) causes as earth etc. as also their causes are unreal since they are not perceived differently from their causes, in that case, may it not be urged that owing to the nonexistence of those (causes) there will arise the contingency of everything becoming unreal [An entity cannot be said to be unreal merely because it is non-different from its cause. Were it to be asserted as being unreal, then the cause also should be unreal, because there is no entity which is not subject to the law of cuase and effect.]? Vedantin: No, for in all cases there is the experience of two awarenesses, viz the awareness of reality, and the awareness of unreality. [In all cases of perception two awarenesses are involved: one is invariable, and the other is variable. Since the variable is imagined on the invariable, therefore it is proved that there is something which is the substratum of all imagination, and which is neither a cause nor an effect.] That in relation to which the awareness does not change is real; that in relation to which it changes is unreal. Thus, since the distinction between the real and the unreal is dependent on awareness, therefore in all cases (of empirical experiences) everyone has two kinds of awarenesses with regard to the same substratum: (As for instance, the experiences) ‘The pot is real’, ‘The cloth is real’, ‘The elephant is real’ — (which experiences) are not like (that of) ‘A blue lotus’. [In the empirical experience, ‘A blue lotus’, there are two awarenesses concerned with two entities, viz the substance (lotus) and the quality (blueness). In the case of the experience, ‘The pot is real’, etc. the awarenesses are not concerned with substratum and qualities, but the awareness of pot,of cloth, etc. are superimposed on the awareness of ‘reality’, like that of ‘water’ in a mirage.] This is how it happens everywhere. [The coexistence of ‘reality’ and ‘pot’ etc. are valid only empirically — according to the non-dualists; whereas the coexistence of ‘blueness’ and ‘lotus’ is real according to the dualists.] Of these two awareness, the awareness of pot etc. is inconstant; and thus has it been shown above. But the awareness of reality is not (inconstant). Therefore the object of the awareness of pot etc. is unreal because of inconstancy; but not so the object of the awareness of reality, because of its constancy. Objection: If it be argued that, since the awareness of pot also changes when the pot is destroyed, therefore the awareness of the pot’s reality is also changeful? Vedantin: No, because in cloth etc. the awareness of reality is seen to persist. That awareness relates to the odjective (and not to the noun ‘pot’). For this reason also it is not destroyed. [This last sentence has been cited in the f.n. of A.A.-Tr.] Objection: If it be argued that like the awareness of reality, the awareness of a pot also persists in other pots? Vedantin: No, because that (awareness of pot) is not present in (the awareness of) a cloth etc. Objection: May it not be that even the awareness of reality is not present in relation to a pot that has been destroyed? Vedantin: No, because the noun is absent (there). Since the awareness of reality corresponds to the adjective (i.e. it is used adjectivelly), therefore, when the noun is missing there is no possibility of its (that awareness) being an adjective. So, to what should it relate? But, again, the awareness of reality (does not cease) with the absence of an object.. [Even when a pot is absent and the awareness of reality does not arise with regare to it, the awareness of reality persists in the region where the pot had existed. Some read nanu in place of na tu (‘But, again’). In that case, the first portion (No,…since…adjective. So,…relate?) is a statement of the Vedantin, and the Objection starts from nanu punah sadbuddheh, etc. so, the next Objection will run thus: ‘May it not be said that, when nouns like pot etc. are absent, the awareness of existence has no noun to qualify, and therefore it becomes impossible for it (the awareness of existence) to exist in the same substratum?’-Tr.] Objection: May it not be said that, when nouns like pot etc. are absent, (the awareness of existence has no noun to qualify and therefore) it becomes impossible for it to exist in the same substratum? [The relationship of an adjective and a noun is seen between two real entities. Therefore, if the relationship between ‘pot’ and ‘reality’ be the same as between a noun and an adjective, then both of them will be real entities. So, the coexistence of reality with a non-pot does not stand to reason.] Vedantin: No, because in such experiences as, ‘This water exists’, (which arises on seeing a mirage etc.) it is observed that there is a coexistence of two objects though one of them is non-existent. Therefore, asatah, of the unreal, viz body etc. and the dualities (heat, cold, etc. ), together with their causes; na vidyate, there is no; bhavah, being. And similarly, satah, of the real, of the Self; na vidyate, there is no; abhavah, nonexistence, because It is constant everywhere. This is what we have said. Tu, but; antah, the nature, the conclusion (regarding the nature of the real and the unreal) that the Real is verily real, and the unreal is verily unreal; ubhayoh api, of both these indeed, of the Self and the non-Self, of the Real and the unreal, as explained above; drstah, has been realized thus; tattva-darsibhih, by the seers of Truth. Tat is a pronoun (Sarvanama, lit. name of all) which can be used with regard to all. And all is Brahman. And Its name is tat. The abstraction of tat is tattva, the true nature of Brahman. Those who are apt to realize this are tattva-darsinah, seers of Truth. Therefore, you too, by adopting the vision of the men of realization and giving up sorrow and delusion, forbear the dualities, heat, cold, etc. — some of which are definite in their nature, and others inconstant –, mentally being convinced that this (phenomenal world) is changeful, verily unreal and appears falsely like water in a mirage. This is the idea. What, again, is that reality which remains verily as the Real and surely for ever? This is being answered in, ‘But know That’, etc. na — never; asataḥ — of the nonexistent; vidyate — there is; bhāvaḥ — endurance; na — never; abhāvaḥ — changing quality; vidyate — there is; sataḥ — of the eternal; ubhayoḥ — of the two; api — verily; dṛṣṭaḥ — observed; antaḥ — conclusion; tu — indeed; anayoḥ — of them; tattva — of the truth; darśibhiḥ — by the seers.